In the past, pain management among all veterinary species was overlooked or thought unnecessary. It was thought that the presence of pain and associated sedentary behavior would deter the patient from paying attention to the surgical site. Or, even worse, that some species do not feel pain. We now know that this is a myth. Most, if not all, sources now recommend a more anthropomorphizing approach. This means that if the procedure or condition the animal is going through would be painful to you, then it is undoubtedly painful to your patient. 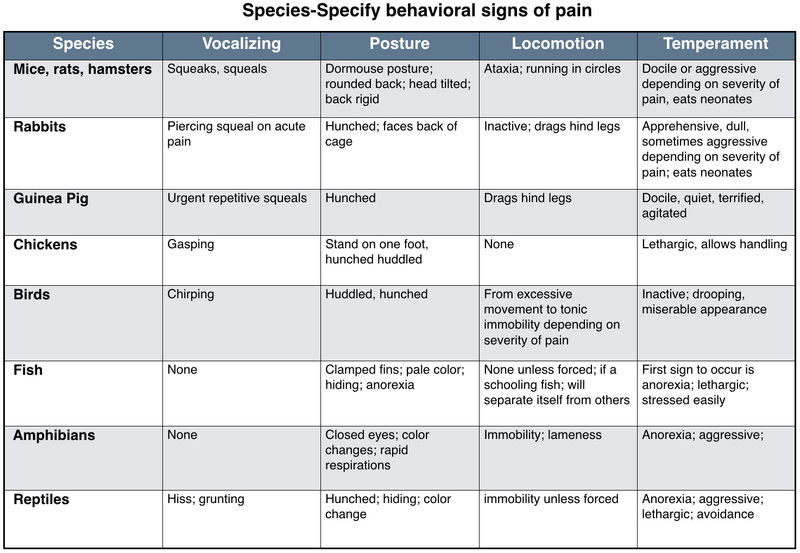 This chart is meant to display some of the different signs species may exhibit if in pain. Individuals may not show any of these signs or they show signs not listed. This is meant as a general guide. Chart created by Mary Ellen Goldberg, RVT and used with permission from “The ‘Fourth Vital Sign'” in All Creatures Great and Small. 2010. The NAVTA Journal. Many of the drugs that we use in exotic species and the doses that we use are based on limited pharmacokinetic studies, extrapolations from other species, or from more invasive tests and assays. With pain management, it is often better to slightly overestimate the pain management protocol rather than underestimate our protocols, as pain is not only uncomfortable but also has more serious physiologic and psychological effects. Despite studies describing nociceptive tests and generalized pain assessments for various species, we still lack a well-validated generalized pain scoring system in veterinary medicine. An article published in 2013 sums up a culmination of studies showing that fMRI can differentiate types and levels of pain in the brain for humans. Although these studies were performed on human subjects, it does open the door for further research into pain detection and stimuli in animal models, where work is already being started. Like everything in medicine, our pain scoring systems in exotic animals are ever-changing and being refined as more scientific and behavioral data is published. Pain management protocols should be thoroughly thought out and designed the same way as in our small animal patients. Protocols should include pre-emptive analgesia to alleviate “wind up”, multimodal analgesia to cover central and peripheral pain receptors, and intra-operative and post-operative pain management. Many times, exotic animals must be anesthetized for physical exams. Appropriate pain management can make anesthesia safer by reducing the percentage of volatile anesthetics (i.e., MAC-sparing) the patient would normally receive without analgesic adjuncts. 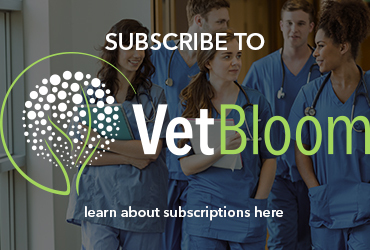 Many of the same localized pain management techniques used in small animals (e.g., splash blocks, nerve blocks, infusion catheters, epidurals) can be adapted for exotic species, and they can greatly reduce central sensitization. However, it is imperative to calculate doses of blocking agents so that we don’t unintentionally overdose the species we are working with. Thorough individual research should be conducted before using local anesthetic methods as well. Careful consideration must be paid as to where the animal species falls in the evolutionary development chain, as suspected orders of receptor evolution follow a distinct path starting with the kappa and delta receptors and more recently evolved mu opioid receptors. Pain in birds serves its purpose the same way it does in all species, to provoke a response by the animal to remove itself from the stimulus. Avian pain pathophysiology is slightly different from mammals. Although largely similar to mammals, the main difference comes from the organization of the forebrain of birds versus mammals and the ascending nociceptive system. Birds have more kappa receptors in general. However, among bird species, there are varied amounts of kappa opioid receptors located in the forebrain. This explains the varied response to mu agonists compared to mammals. It is now accepted birds perceive pain similarly to that in mammals. As prey species, birds are masters of pain disguise and will have one of two responses to pain, a “fight and flight” response or “Withdrawal/conservation” response. Bird experts have thought that chronic pain is more associated with the “Withdrawal/conservation” responses, commonly seen in practice compared to the “fight or flight” response associated with sudden and unexpected pain stimuli. Birds, like other species, have adrenal stimulation under stress with a subsequent release of corticosterone, which has an adverse effect on both the immune system and wound healing. A bird’s stress level is even more exaggerated when in a small cage and its inability to feel that it can fly or get away. Therefore, it is imperative to keep the patient in a quiet, light-regulated environment far away from visible predatory species or other stressors. Many pharmacokinetics studies have been performed on a variety of different species of birds. Summing all the studies up we see a varied and diverse array of efficacy in the varying species of birds. Where one drug like, butorphanol, was found to have analgesic effects on African grey parrots, but did not in blue-fronted Amazon parrots. There are numerous examples of this kind of outcome in the literature today. This kind of research shows not only further research needs to be performed, but also as veterinary professionals in the frontlines, we must make careful and accurate assessments of our patients, starting with the physical exam. If possible, the physical exam should be performed with as little stress as possible to get a set of reasonably normal baseline vital signs and behavior patterns. This may include leaving the bird alone and watch from afar. Drug delivery in birds, like most exotic species, can be tricky. While oral dosing is easiest birds often will need to be gavaged, or syringe fed medication with restraint. This can easily stress the bird and lead to aspiration. If the bird is going to be manually restrained anyway, one might consider injectable medications instead to reduce aspiration risk and confirm adequate dosing. Common sites for intramuscular injection on a bird are the pectoral muscles and if large enough the thigh muscles. It is important while restraining a bird that it is done properly. Birds use their whole body to breath and squeezing a bird may inhibit normal tidal volume intake. If the bird is going to be anesthetized or is easily handled intra-venous access is also an acceptable method, however IV injections often wear off quicker. Subcutaneous injections are often given in the inguinal region of birds. Reptile pain management protocols should be thought of and implemented the same way as any other species. Within varying reptilian orders are huge physiologic and behavioral adaptations making pain assessment subjective. If there is a question as to whether a procedure or condition of the patient warrants analgesia, the patient should receive the benefit of analgesia. A physical exam with baseline vitals should be conducted. One may have to step away from the animal to observe normal non-stressed respiratory rates as with birds. In some species of reptiles, like snakes, one can even see the heart beat through the skin. Often, if not all of the time, reptiles exhibit no obvious signs of pain other than changes in behavior. Therefore, to be effective pain management advocates it is imperative to know what a particular species and patient’s behavior patterns are. This is where detailed and accurate client communication is vital as well as an excellent patient history. The exact pathophysiology of nociception in reptiles is still not greatly understood. However, neuroanatomical components for nociception have been described in multiple reptile models. This is strengthened by known pharmacologic agents that provide analgesic effects in other species providing similar to the same affect in some reptile species. Similar neurotransmitting features to that in mammal nociceptive modulation have been described in some species. Red-eared sliders have both functional mu and delta receptors in their brains, while at least two species of snakes have endogenous brain opiates. This pathology, as with many reptile experts, clearly suggests that reptiles do feel pain similarly to that in mammals. Even with this evidence the full understanding of reptile nociception is unclear in regards to “perception” or the emotional component higher species have. Not only do reptiles have an interesting and variable neuroanatomical and receptor pathology, but a varying and tricky systemic use of drugs in general. A study in red-eared sliders discovered that the femoral veins drained directly into the abdominal vein, which then went straight into the liver. The liver being a filter, then had notable pre-systemic extraction of the drugs, reducing bioavailability. Reptiles also have the renal portal system, which moves blood from the back half of a reptile through the kidneys before returning to the heart. This system has been linked to filtering of medications before systemic dispersion happens. With the renal portal system in reptiles, it is usually more effective to give injections in the front half of the patient. This is also an important development as many reptile species are used in the research setting. This is clearly evident in the research with NSAIDS in reptiles. Only one study thus far testing for analgesic efficacy has been published using ball pythons with doses of meloxicam, the most commonly used NSAID in reptiles. Serpents in other opioid-related studies have been shown to have a strikingly different anti-nociception affect than in chelonians and lizards, bringing to light concerns about dosing and efficacy in the other species. An example of this is commonly occurring thermal burns in snakes. It has been theorized that the evolution of snakes with their limblessness could have altered the spinal opioid expression of receptors, as well as function. A pharmacokinetic study with green iguanas showed seemingly appropriate plasma concentrations of NSAIDs does not have a direct and predictable correlation to clinical efficacy. Another example involving opioids, the best-accepted drug for pain relief, used butorphanol. Butorphanol is a commonly prescribed kappa agonist and mu antagonist in reptiles for pain relief. However, it had no effect in corn snakes and worked well in bearded dragons. In contrast, morphine, a mu agonist worked well in the corn snake and not in the bearded dragon or turtles. Aquatic turtles tend to have more delta-opioid receptors than mu-opioid receptors in the brain, but the determination of the receptors in the spinal cord is still unknown. Authors in many of the more recent opioid studies note respiratory depression in their papers at higher doses, which, unfortunately, tend to be the most effective in anti-nociception. This should be a careful factor in dosing our patients. While most reptiles can tolerate a lower respiratory rate and even tolerate periods of anoxia, for excellent tissue healing and perfusion a bradypnea patient may hinder a speedy recovery. Delivery of analgesics to reptiles comes in many of the same forms as with mammalian administration. Subcutaneous, intramuscular, and oral administrations are the more common methods. Reptiles for oral administration of medications may need to have their mouth manually opened with a guitar pic or credit card. Although somewhat controversial, IM injections into the hind end of a reptile may be less effective due to the renal portal system. Intravenous access is also possible in reptiles but is less practical and more difficult. Reptiles also can be given intra-coelomic injections. Amphibians, unlike reptiles, go through different stages of metamorphosis during their life span. Amphibians go from having gills to lungs, being aquatic to semi-aquatic, having no legs to four or two and now with environmental contaminants sometimes six, more or less. This means at two different times in their lives we may treat amphibians differently. At one point like a fish and another more like any other terrestrial creature. Amphibians are considered a “lesser vertebrate,” which means, as mentioned above; they fall lower on the evolutionary development chain. With this said, amphibians still do possess a well-developed endogenous opioid system with corresponding binding sites, primarily kappa-like receptors. Not only do opioids provide analgesia, but also, there has been potential shown with other drugs like ketamine, alpha 2’s and tricaine methanesulfonate. It is important to note that amphibians have a reduced rate of hepatic metabolism of certain medications and appear to require greater doses of opioids for systemic effect than mammals. Although nociceptive receptors and the seemingly effective treatment of perceived pain exists with amphibians, there is but one problem. There exists no thalamus to cortex networking to the cerebral cortex. This important anatomical neural feature makes its first appearance in reptiles. What this means is, amphibians still feel pain, but it may be much different than the way you or I may appreciate it. One of the advances in veterinary pain management is the use of transdermal patches that deliver analgesia through the skin. In amphibians, this has always been the case. Common anesthetic practices include anesthesia administration through the skin and thus is the same with analgesics. Common routes used in reptiles can also be used in amphibians. Pain management in these species is similar to that in the cat and dog with the exception of handling and restraint as well as dosing. Dosing ranges vary from text to text with ever changing research into the efficacy of drugs and dosages thus far described. It is imperative for the reader to be constantly researching the newest most supported methods in pain management for whatever species one is working with. The recent publication of the mouse, rabbit and rat facial pain-scoring chart is a crucial addition to any exotics practitioners’ library. Sites for analgesia delivery vary from species to species and feasibility depending on muscle mass for IM injections, vascular access for IV injections and availability of SC space. 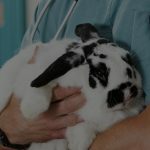 Rabbits are common pets and used extensively in the laboratory setting. In the laboratory setting, rabbits are often used as epidural and intrathecal models. As such, epidural and intrathecal routes of administration can be utilized in these species. Signs of pain in these species mirror that of rodents, with the addition of hair plucking or ileus. Ileus can be intensified by the addition of opioids. Lagomorphs tend to be a sensitive species to chemicals of any sort, including analgesics. Fortunately, more species-specific research is being performed finding more definitive dosing and relying less on extrapolation. 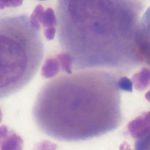 One of the most recent studies published found previous meloxicam doses may be not as effective as once thought. The study highlights the importance of constant and relevant research into pharmacokinetics for all species. Insectivore analgesia lacks a thorough research and practitioners are urged to investigate analgesia protocols for these species as more information becomes published. It is common practice to extrapolate doses of pain medications from rodent models. One published dose of buprenorphine is available at 0.01-0.03mg/kg SC q12hr for hedgehogs. Much like insectivores, very limited published data is available for marsupials and their 260 represented species in the world. In general, marsupials tend to need higher doses of anesthetics and presumably analgesics for unknown reasons.